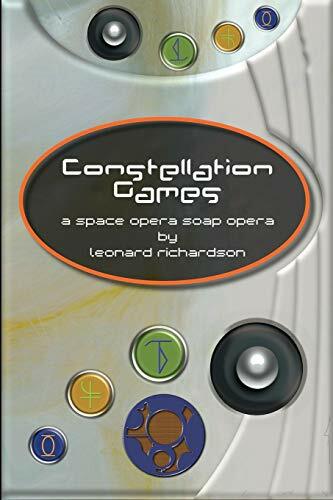 Constellation Games is a very funny book, with an effective sweep into pathos that delivers a powerful message. It starts with snarky blog posts from our protagonist, Ariel Blum, situating him as an avatar of geekdom. He's a burnout game developer with a penchant for reviewing old games—but this is the moment when Earth is contacted by aliens who have come through a wormhole to discover humanity. The Constellation are first encountered mining the dark side of the moon. They create for themselves a massive space station by, building Ring City to provide independent habitats for each of the civilization's couple dozen species. In an effective piece of othering, the names given to each of these species are not their words for themselves but a human word for alien, from the Aliens to the Goyim, the Farang to the Inostrantsi. This is a constant reminder of their distinctiveness, and implies that even the aliens' names for each other begins with the concept of "alien." The text effectively extends this by showing the distinctiveness of each species, both visually and in terms of their culture. Clearly, Richardson has put a lot of thought into the configuration of Constellation society; equally clearly, he lets that worldbuilding support the story he wants to tell rather than diverting into anthropology. The Constellation has some practice with contact, but with twenty-four successes over eight hundred million years, the individual aliens on this mission have little personal experience—except, perhaps, for Her, the hive mind speaking in the quote above. Even so, the alien protagonists are trained for contact—Ariel's primary interactions are with an anthropologist, an archaeologist and a historian—and all of them have experience of the multiplicity of their own societies, which enables them to give Ariel a broader perspective on his own life and society. By the end of the book Ariel has taken on a savior-of-humanity role he thought he knew from many games. This time, though, he has to save humanity from itself, not the Constellation, which is a "post-scarcity anarchy" (p. 191). Can we survive the end of scarcity? What do we do when a different singularity arrives? "What would you do," Curic asked me, "if you knew that something catastrophic was going to happen to your home planet?" "I . . . don't like where this is going."
. . . "For instance, suppose that increasing concentrations of carbon dioxide and methane were destabilizing the Earth's climate." "Oh that," I said. "We already know about that." "What did you do when you found out?" If that is what how we respond to a known threat, surely the Constellation have a responsibility to save us from ourselves? Even so, the aliens split into two primary factions, one of which wants to "Save the Humans" whilst the other believes our culture is beyond saving and wishes to save what species it can before Earth goes over the "fossilization line." "It's Adam and Eve from Carl Sagan's gold record. Wait, did the Constellation find those probes?" Later, Ariel is gifted an Alien book titled "Exert Dominion Over Friends Using Gaming Tactics Unmatchable Unless Your Friends Also Own This Book" (p. 133), whilst the Gaijin mesh computing system is called "The Big Map That's Easy To Understand"(p. 244). These literalistic translations are matched by Ariel's blog post titles—"Game Reviews of Warmed Over Resentment" (p. 15), "Oh My Goodness It's New Hardware Time Again" (p. 69), "Game Reviews of Lies Lies Lies" (p. 178). A flick through the pages also offers up a mess of typographies, used to separate Ariel's collected reportage under separate headings such as "Real life," "Blog post," and "Private text chat." The font variation proves necessary as the actual content of the different sections often lacks differentiation of voice or tone. The "Blog post" entries in particular are initially intended to provide a "public voice" and act as the locus of the alien game reviews, but as the novel progresses they use the same directly quoted speech and narrative devices of "Real life." Perhaps this is intended to indicate that Ariel's persona and his personality are merging; certainly by the book's end there is little reminder but font of the different way this story is being shared. Beyond all the surface gimmicks and amusements, the story itself is also worth pursuing. Constellation Games starts from a clever premise but it doesn't get stuck there. How can we trust the aliens' claims that they haven't come to invade Earth? If a civilization has had tens of millions of years to learn the lessons of their own first contact experiences, can they even still remember them? If the aliens are enough like us to have computer games, are they enough like us for those games to be fun? How much can any of us learn about another culture from its artifacts? Is it ethical to intervene to save a society from itself? Are you still intervening if you choose to awaken that society to itself? From humor to pathos via a hundred interesting questions. Like the Ignobel awards, Constellation Games makes you laugh, and then it makes you think. Duncan Lawie grew up in Australia and lives on the Kent coast. His work also appears in Media Culture Reviews.